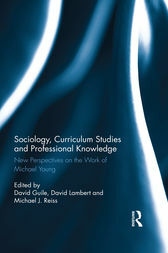 This volume brings together an international set of contributors in education research, policy and practice to respond to the influence the noted academic Professor Michael Young has had on sociology, curriculum studies and professional knowledge over the past fifty years, and still has on the field to this day. It provides a critical analysis of his work and the uses to which it has been put in the UK and internationally, discussing implications for debates on the purpose of education and how school curricula, as well as programmes in other educational settings, could be run and teaching undertaken, based on his contribution. Following Michael’s long and distinguished career – dating back to before Knowledge and Control: New Directions for the Sociology of Education, which Michael edited in 1971 – recent years have seen an upsurge in both academic and policy interest in his work, including the new concern he expressed for knowledge in his 2007 book Bringing Knowledge Back In. The book concludes with an appreciation and a response to the authors from Michael Young and a Coda from Charmian Cannon, who was on the Institute of Education panel that appointed Michael to his post in 1967. This timely book is a unique critique and celebration, written by experts whose own careers have been affected by Michael, and will appeal to all those with an interest in the work of Michael Young. David Guile is Professor of education and work at the UCL Institute of Education, University of London, UK. David Lambert is Professor of geography education at the UCL Institute of Education, University of London, UK. Michael Reiss is Professor of science education at the UCL Institute of Education, University of London, UK.